In Game Two of the Western Conference Semifinals, DeAndre Jordan rejected a Dwight Howard scoop shot back out and into the stands, then, on the opposite end of the floor, he out-leapt Howard for an offensive rebound before going into a spin move and slamming the ball down with authority. Finishing the game with 16 points, 12 rebounds, two steals, and two blocks on the road, it was, in many ways, a signature performance from one of the league’s most coveted free agents. Jordan is a crowd-pleaser that has also proven that he can serve as a solid building block towards a deep postseason run. While there are some questions in a vacuum about whether a raw athlete and defensive specialist — who absolutely positively cannot shoot free throws — is worthy of a maximum deal, NBA free agency doesn’t exist in space, and big men are getting paid. At least three organizations do appear driven to take out the Golden State Warriors in the West, while also showing a willingness to be very liberal with their respective checkbooks when it comes to the best big in Southern California. Every year Mark Cuban’s Dallas Mavericks are in the hunt for free agents, and Jordan is no exception, particularly as he is a Texas native who grew up in Houston and starred at A&M. For Dallas, DJ would play much the same role that Tyson Chandler did during their championship run, as a younger defender, rebounder, and shot blocker that also feasts upon lobs and put-backs — although Chandler is undoubtedly a much more nuanced defender. With Jordan and Nowitzki both on board, Dallas can leverage multiple assets in an effort to bring in another wing playmaker and serviceable point guard. Before we assume Jordan gives the hometown crew preference, we’ve got to acknowledge the rumors — best summed up by a David Aldridge source who simply stated “they don’t like each other.” The 2014-2015 Clippers roster included a wide range of brash personalities, in Chris Paul, Blake Griffin, Matt Barnes, and even Doc Rivers — and these chemistry issues could have contributed to their disastrous end, when they were further exposed in the Semifinals, when the Clippers collapsed and were blown out of the last three games of the series. In response, the Clippers promptly dealt Matt Barnes was promptly traded to Charlotte in exchange for Spencer Hawes and Lance Stephenson. 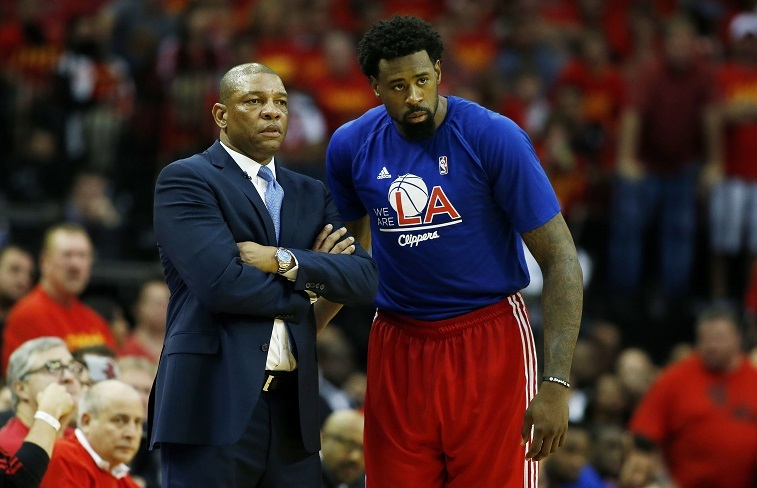 For now, the jury still remains out as to whether the L.A. Clippers can seriously contend for a championship with Doc Rivers pulling the strings as both the Head Coach and General Manager. That said, Lob City would still be the most electric high-wire act in basketball, featuring Jordan alongside Blake Griffin and Chris Paul. The Clippers are especially deadly on the pick-and-roll, with DJ and Blake camping out at the front of the rim, while long-range bomber J.J. Redick spots up behind the arc. 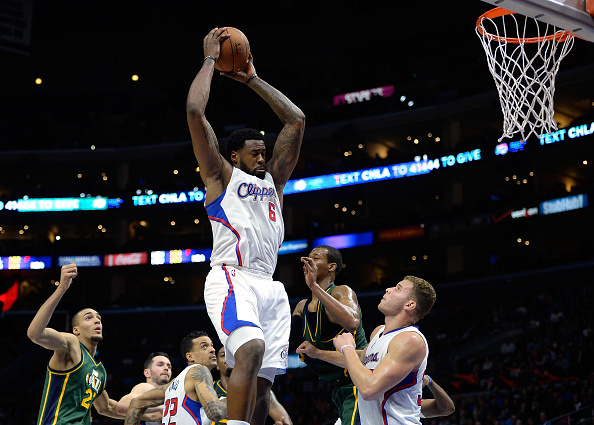 The 2014-2015 Clippers torched defenses for 107 points per game, second only to the eventual champion Golden State Warriors. The Lakers want to win one more ring with Kobe Bryant, they want to recapture the title of the best Los Angeles team in the NBA (something that even five years ago would have been a laughable notion), and DeAndre Jordan is one of the most perfect free agents to chase after in order to accomplish this goal. 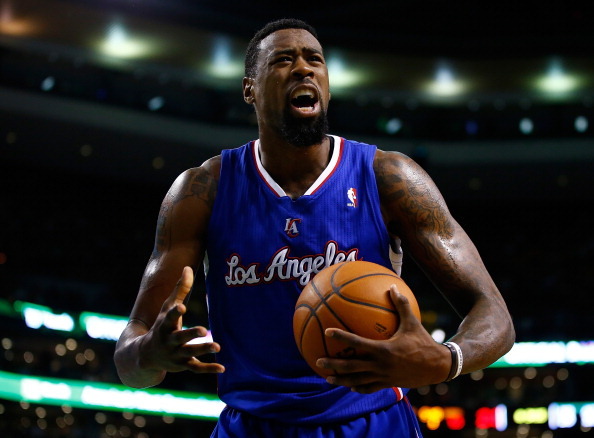 Various reports have suggested that Kobe has already reached out to DeAndre Jordan with a strong recruiting pitch. While some saw the Lakers passing on Jordan after picking up a big with the second pick in the 2015 draft, the Lakers wound up taking D’Angelo Russell instead of seven-footer Jahlil Okafor. As a Hollywood-ready showman, Russell dazzled crowds, in putting up 19 points, six rebounds, and five assists per game through his freshman year at Ohio State. In Jordan, the Lakers would have someone to clean up after the rest of the Laker. Power forward Julius Randle is most likely a marginal defender at best, while Kobe, at 37, may now lack the foot speed to chase down young guards. As an added bonus, GM Mitch Kupchak would deal a blow to a Clippers franchise that had suddenly surpassed the glamour Lakers as the hottest ticket in Southern California.